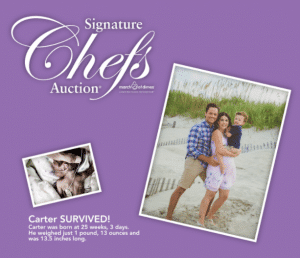 The March of Dimes Signature Chef’s Auction is scheduled for Monday, October 23, 2017 from 6:00 – 9:30 p.m. at the Charleston Marriott Town Center. Guests will be treated to an evening of culinary masterpieces provided by premier local chefs and exceptional auction packages. This year’s ambassador family is Cody, Mary & Carter Richards. 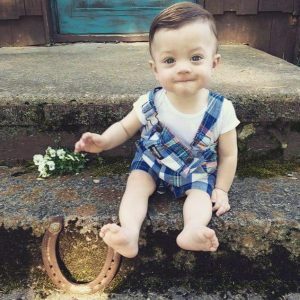 Carter was born at 25 weeks, 3 days and weighed just 1 pound, 13 ounces at birth. He was 13.5″ inches long. Today, Carter is thriving and developing normally thanks to the skilled doctors, nurses, and staff of the NICU. Tickets for the event can be secured here. Or call Kristin at 859-402-1711. Thank you WOWK for your sponsorship. The event will be co-hosted by Jennifer Abney & Jim Strawn.